Nicolas Altstaedt and friends cap off a highly successful UKARIA 24 with a double bill of Schumann and Brahms. UKARIA Cultural Centre’s annual UKARIA 24 festival centres on the vision of its guest curator, who is given (more or less) carte blanche to program as they see fit. Australian recorder player Genevieve Lacey curated the inaugural festival in 2016, while accordionist James Crabb curated last year’s festival. 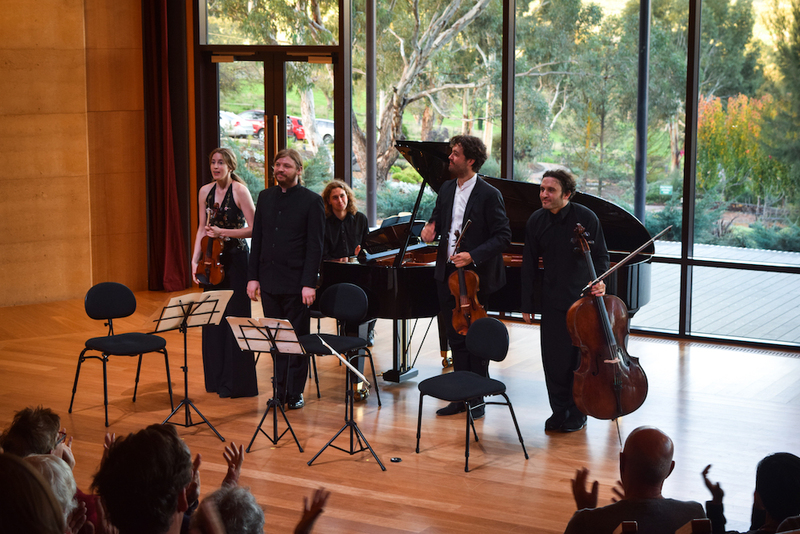 In 2018, German-French cellist Nicolas Altstaedt – artistic director of the Lockenhaus Chamber Music Festival, which inspired UKARIA 24 – brought his unique musical vision (and a handful of world-class soloists) to the Adelaide Hills, presenting an intelligent program of music from Haydn and Bach to John Cage and Jörg Widmann, in a festival humming with Altstaedt’s own intense energy, musical flexibility and zest for multi-disciplinary collaboration. While the evening concerts on the Saturday and Sunday were the larger programs, the short morning concerts were just as stimulating. Visual Polyphony on the Sunday saw two dancers from Australian Dance Theatre joining Altstaedt for athletic performances centred around Bach’s Cello Suites, in remarkably natural duets between instrument and body. Zoë Dunwoodie found a writhing dynamism in the famous first suite, while Matte Roffe’s performances was more liquid, though no less athletic, his choreography to the fifth suite evoking a profound sense of vulnerability. Generations on the Monday morning saw Norwegian violinist Vilde Frang join Altstaedt in fantastically charged, visceral performances of Kodály’s Opus 7 Duo and Kodály’s student Sándor Veress’ String Trio (with British violist Lawrence Power). The Festival culminated, however, in a program that – on paper, at least – was the most traditional of the weekend: a double bill placing Schumann’s Cello Concerto (in an arrangement for strings by Michael Waterman) alongside Brahms’ Second Piano Quartet, closing UKARIA 24 with all four soloists on stage. Schumann wrote his Cello Concerto in a matter of 14 days in 1850, shortly after moving to Düsseldorf for a new posting, and Altstaedt seemed to channel that same feverish intensity in his performance with the Momentum Ensemble’s strings. Altstaedt gave the audience a Schumann of extremes: each phrase was delivered with detail and intention, from whisper quiet pianos to roaring crescendos, the cellist’s rich low register more than a match for the chamber orchestra behind him. The Momentum Ensemble was in top shape, giving an exciting performance that fed off Altstaedt’s energy and amplified it, delivering explosive accents and crisp playing. Altstaedt’s sensitive duetting with cellist Jack Ward in the second movement was a highlight, as was his high-energy back and forth with the ensemble in the finale, his solo line a powerful frenzy of virtuosity. It began to rain during the Schumann, clouds darkening the view through the floor-to-ceiling windows backing UKARIA’s stage – Altstaedt’s encore with Momentum concertmaster Nicolas Waters was, suitably, Sibelius’s Vesipisaroita (water drops) – but by the first serene notes of the Brahms Quartet it had eased and a rainbow was visible behind the musicians. Brahms began sketching what was to become his Second Piano Quartet not long after the death, in 1856, of his friend and mentor Schumann, and while Clara Schumann played the piano part in Brahms’ First Quartet, Brahms himself used his Second for his debut – as a composer and pianist – for his Vienna debut in 1863. Russian pianist Denis Kozhukhin stood in for Brahms on Monday, joining Frang, Power and Altstaedt in a performance remarkable for its heady depth of sound and beautifully pacing of Brahms’ long-phrased design. While all four parts burned with what at times was an almost violent ferocity – and here they were very much equal partners, their distinct individual musical personalities brought to bear on a single vision – the soft, shimmering of the Poco Adagio was an enchanting change of timbre, piano glistening above the strings. The fire returned in the string-slapping intensity of the third movement and Hungarian folk music of the fourth, sparks flying across the dancing call and response between Frang and Altstaedt and Powers growling with the cellist against Kozhukhin’s piano, the musicians driving forward to the boisterous finale in a satisfying finish to the festival. Following the Schumann, Ulrike Klein – the mastermind behind UKARIA – announced the 2019 UKARIA 24 curator: Sydney Symphony Orchestra’s Principal Oboist Diana Doherty, who will no doubt bring her own very different vision and personality to next year’s festival. Garry Stewart has his sights set on creating a pre-eminent arts event with the Adelaide Dance Festival. Composer Gordon Hamilton and beatboxer Tom Thum will be the first artistic team to take up the new artistic residency in the Adelaide Hills. Nicolas Altstaedt channels the symphonic in another fascinating program at UKARIA 24. Nicolas Altstaedt kicks off UKARIA 24 with a program both intelligent and utterly compelling. The cellist and curator of UKARIA 24 talks about his love of chamber music and what working with living composers can teach us about the music of the past. Full-blooded accounts of favourites from the master of melody. Osborne's classy impressions, Takács' sparkling Dvorák, Vänskä and his Minnesotans embrace Mahler's Fifth and more. Altstaedt and Madžar make light work of a heavy programme. Soprano Emma Pearson gives her all in Golijov’s monumental Ayre. In his new sonata, Aspects of Return, native cello-speaker Jakub Jankowski draws on psychology, philosophy and poetry. The founder of skincare company Jurlique, who gave Adelaide the UKARIA Cultural Centre, describes the cosmic power of Bach. Ulrike Klein’s new Ngeringa Cultural Centre has been specifically designed for the performance of chamber music. A few inconsistencies fail to blight an otherwise exhilarating conclusion to this year’s Festival.